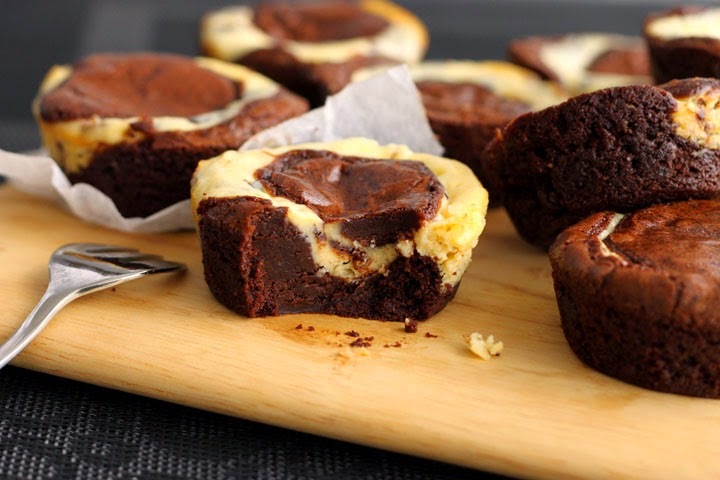 One of the first recipes I got stuck on when I discovered my passion for baking many years ago was a cheesecake brownie. I couldn't get enough. Two of the most delicious and decadent things mashed into one bite. I still love this combo to this day and today I took it to the extreme in terms of fudginess. This is practically candy. I'm sticking to my stracciatella theme from last week, putting chocolate chips through the cheesecake batter. It's chocolate everything in Christina's world right now (and always) since I'm wrapping up recipes for a second cookbook dedicated to everything chocolatey and sweet and salty. It starts with a dang good brownie recipe. Cocoa flavour comes in two hits - dark melty chocolate and cocoa powder. 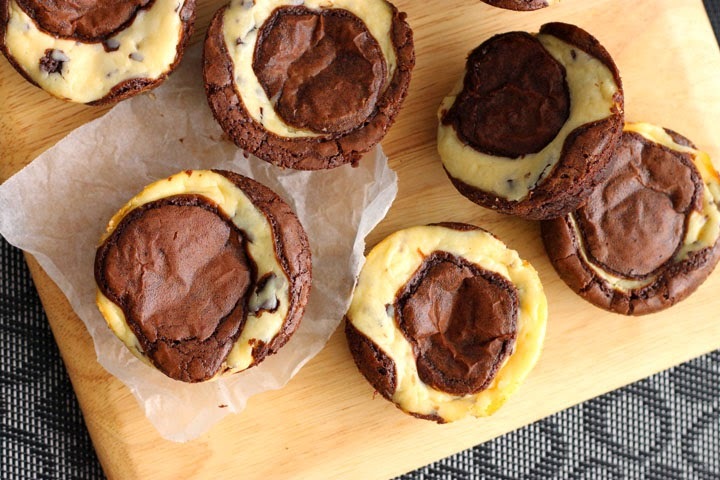 Melt them together with butter to kick things off. Then we need to build that shiny crust and that comes from dissolved sugar. Whisk the sugar in a bowl with one whole egg and one egg white until well blended and lightened by a shade. This recipe is truly efficient because we'll save the yolk for the cheesecake mixture. Stir the melted chocolate mixture into the eggs and then stir in the flour. For the cheesecake we beat cream cheese with sugar until all smooth and glossy and then stir in the reserved yolk and vanilla. You can do this all by hand with a bowl and a spatula. Mixing the sugar first with the cheese prevents lumps in your batter. Sugar crystals are abrasive and help smooth out the cheese, but they also pull out the moisture which helps to make it fluid. Beating eggs into soft cheese before adding the sugar will make a lumpy cheesecake. Believe that. A bit of yogurt lightens up the mixture and adds some tart to all that sweet. Stir in chocolate chips or, as I like to do, some finely chopped dark chocolate. 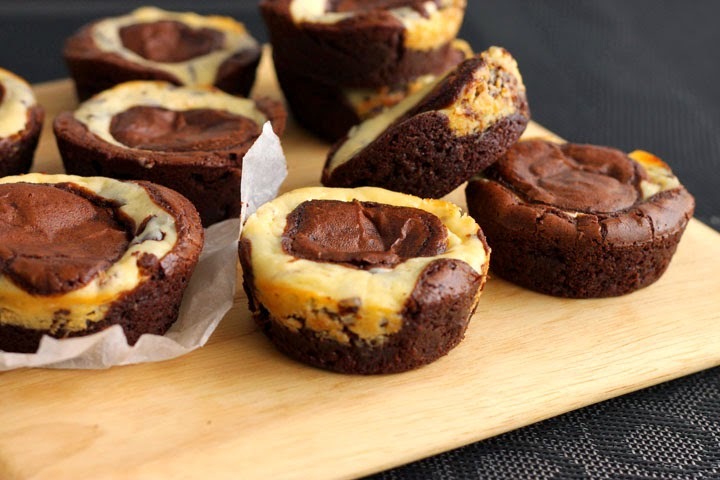 Layer the two batters into the wells of a greased muffin pan and bake until the top is shiny and the cream cheese mixture is just set. Mom would love these, but she'll have to love them from afar since we live in separate cities. You can lick your screen ok? I'll give you the real stuff next time you're here. For now, just accept these pretty pictures and a card by mail. Send love and chocolate to your mom today and everyday. She deserves it. Baby-making is hard work. Preheat your oven to 325°F. 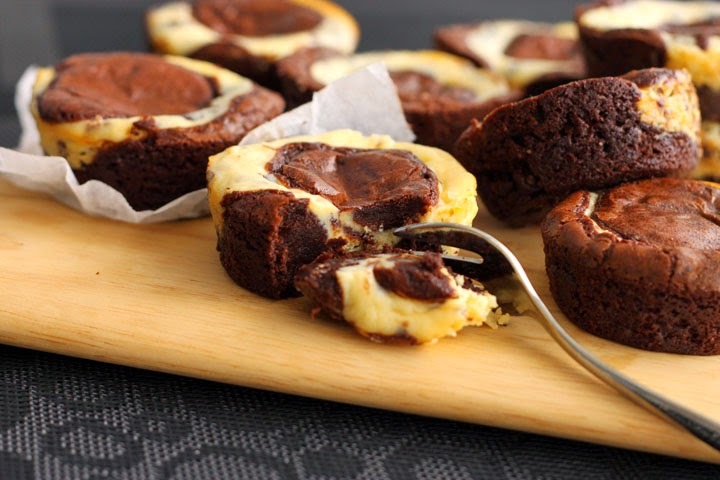 Grease a standard 12-cup muffin pan. To make the brownie batter, melt together chocolate and butter in a large heatproof bowl set over a pot with ½-inch of barely simmering water or in the microwave. Stir in cocoa powder and salt. Remove from heat and set aside to cool for 5 minutes. In a separate medium bowl, whisk together whole egg, egg white and sugar until thickened and pale. Whisk in melted chocolate mixture. Sprinkle flour over batter and stir it in gently until you can no longer see it. To make the cheesecake mixture, beat cream cheese in a medium bowl with a wooden spoon until smooth. Beat in sugar until glossy and then whisk in egg yolk and vanilla until creamy and smooth. Stir through yogurt and chocolate chips. 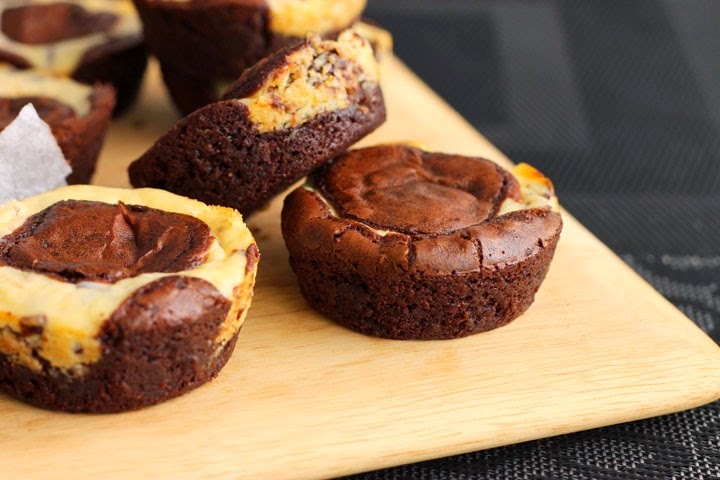 Spoon about one tablespoon of brownie batter into each muffin hold. 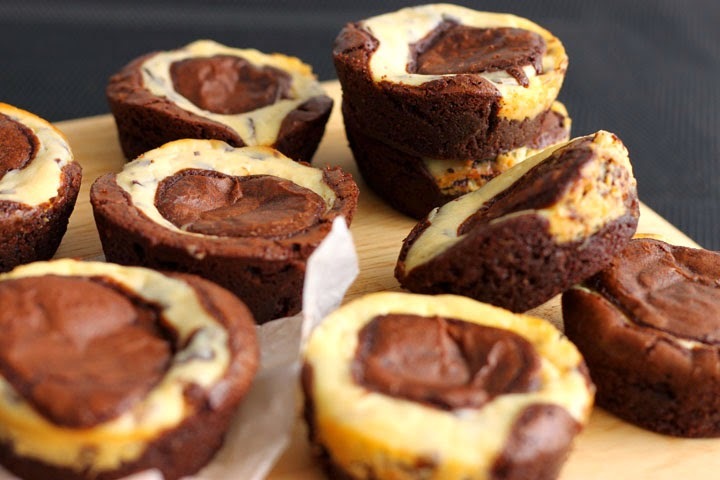 Divide cheesecake mixture among each muffin hole over the brownie batter. Spoon remaining brownie batter over the cheesecake mixture, dividing it equally (no need to spread it out). Bake until slightly puffed and a toothpick inserted into the center comes out with a few moist crumbs, about 20 minutes. Let brownies cool completely in the pan before and then refrigerate for 1 hour before running a knife around the edges and removing from pan. This is really mouth watering. I want this now please.